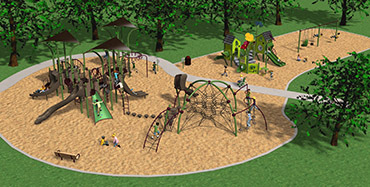 A successful playground begins with a well-developed plan, and Dakota Playground is your resource for playground planning and development. We can help you determine what you need to make your playground age appropriate, safe and accessible. Our knowledgeable staff is happy to come meet with you, evaluate and measure your site and discuss your project vision. We will provide product catalogs for you to browse prior to our meeting to help you explore your options. We offer design planning assistance at no cost. 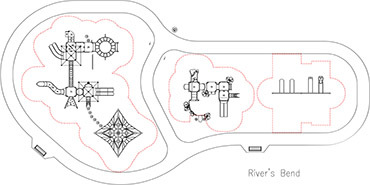 Our designers will develop a 2D design plan that meets all of your preferences. We are happy to make design adjustments and provide you with a revised plan and quote. Looking for something with vibrant colors or nature themed? Let our experienced team help you choose a theme or color palette that fits your project. We can provide you with 3D renderings of the design(s) and send you digital images or even prepare a poster-sized presentation board with Power Point images. Let Dakota Playground install your playground! We are certified, licensed, bonded and insured. Our crews are professional experienced installers. Host a community build event and have volunteers do the installation! Community builds are a great way to save costs on installation and bring a sense of pride and spirit to a community. 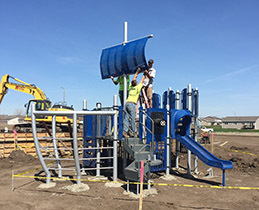 Dakota Playground provides detailed installation instructions with every order. . Some component installations can be challenging for inexperienced installers so please contact your sales representative about utilizing one of our foremen to supervise your build if you are going with a community build. Let them celebrate! 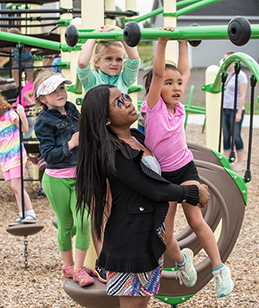 Plan a grand opening to get the whole school or neighborhood excited about the new play equipment. Bring on the fun!